The Danish military might seem tiny, but you don’t want mess with it. This goes extra for the Danish army’s machine guns. The Danes have been fighting in Afghanistan as long as the United States. Although Denmark officially ended its combat role in 2013, it still has around 300 soldiers in Helmand province training Afghan troops. It’s come at a cost—Denmark has lost 47 soldiers in the war. The Danes have also been involved in some of the heaviest fighting. After all those years, the Danes have gained a lot of experience with machine guns. They’ve learned that the best machine guns combine agility with stopping power and accuracy. After a competition to find a new machine gun for its ground troops, the Danes have a chosen a heavily-upgraded—and intimidating—weapon from the past. If the weapon looks familiar, it’s an upgraded version of the M60—the famous 7.62 NATO-caliber machine gun first used by U.S. forces during the 1950s. It is also the characteristically huge American machine gun, famously associated with the Vietnam War and popularized by countless bad action movies. 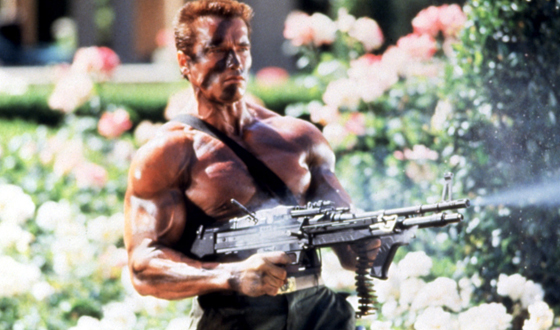 Muscled-up action stars from the 1980s weren’t worth their weight in bodybuilding oil without an M60. But the M60 had its problems. It weighed heavy at more than 23 pounds. (Plus, you have to carry ammo.) If the barrel overheated from fully-auto fire, you needed gloves to swap it out without burning your hands. Though, on the plus side, it had a high rate of fire, was otherwise simple to use and maintain—and had a lot of firepower. The M60E6 includes several modifications, making it lighter, more accurate and easier to fire on the move. It weighs 20.6 pounds, shaving off a few precious pounds from the vanilla M60. That’s much lighter than the 25.6-pound German MG3 the Danes currently use. The upgraded gun fires 550 rounds per minute compared to the 1,200 rounds per minute fired by the MG3. This saves ammo, and gives the gunner a weapon with greater accuracy—and one easier to control. The weapon also has a second pistol-style grip below the barrel that gives it greater stability. There’s also no need to wear gloves when swapping out the barrel, since the barrel has a tiny handle attached to it. And the upgrade adds railed mounts so the user can install flashlights and lasers. Nor does it sacrifice range—the 1,200-yard effective range is the same as the standard M60. In a minor way, the machine gun reflects a Danish military that’s increasingly focused on counter-insurgency. Denmark’s current MG3, like the original M60, were both based on the German World War II-era Mg 42. These were all heavy, mean guns not intended to be moved around very much. But Denmark, like the rest of NATO, isn’t planning—or expecting—to fight big, conventional land wars. Instead, soldiers are being tasked with operating in far-away places where mobility counts, and where ammunition is at a premium. The Danish military also wants to trick-out its new guns. American defense contractor U.S. Ordnance is the only company that makes the M60E6, and according to Jane’s, the Danes are seeking “unspecified daylight optics, thermal optics, red dot optics, tactical lights, tactical lasers, and laser range finders.” The total cost is $16.6 million for 700 M60E6s with accessories. Not included: The bodybuilding oil and 1980s-era Rambo headband.